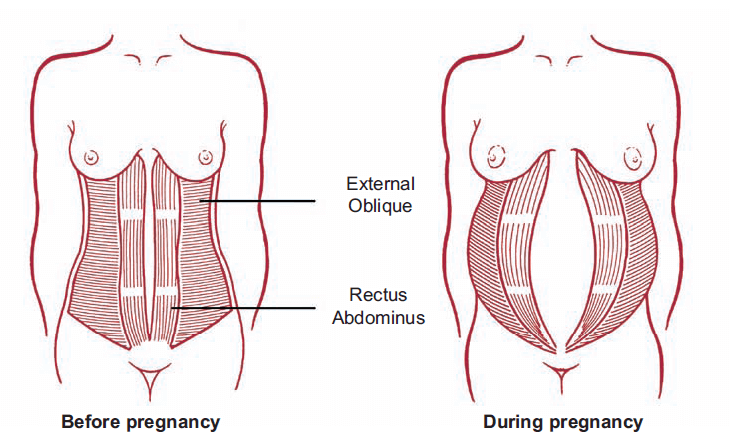 In today’s blog we will discuss Diastasis Recti (“DR”) during pregnancy. 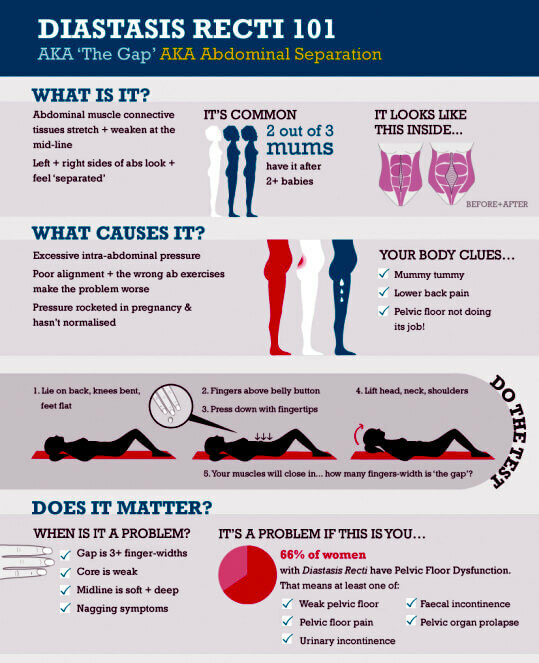 Check out Diastasis Recti Part 1 for more information on what DR is and how and when to test for it…and make sure to read all our best DR postpartum tips in Part 3! But for today…. we’ll talk about Diastasis Recti During Pregnancy. First of all, I would like to reassure you that some degree of abdominal separation will always occur during pregnancy. This is because everyone’s core muscles have to expand to give room for the baby to grow! Us wonderful women are made to make babies and our amazing bodies are made to adapt to accommodate our baby without any third party help! So in a lot of cases the separation will not be severe and it will heal naturally post birth with no medical intervention. In about 60% of pregnancies the abdominal separation will be wider than 2 – 2.5 finger widths apart and you will be considered to have DR during your pregnancy. DR in pregnancy will, in most cases, heal naturally post birth, especially if you take the right steps and do the correct exercises! Generally, DR will not develop until the latter part of the second trimester or in the third trimester, although it can develop earlier. The most likely causes, or factors that lead to DR developing in pregnancy include gaining a lot of weight quickly upon becoming pregnant, gaining too much weight throughout the duration of your pregnancy, if you are carrying more than one baby, you have a big baby, if you are over the age of 35, if you have subsequent pregnancies that are close together or if you had poor core strength or posture pre-pregnancy. Often you are not checked for DR at all during pregnancy. I advise my clients, however, to check themselves (or ask a specialist to check them) or you can accidentally increase your risk of DR or make your DR worse. If you can take a few steps to prevent a problem why wouldn’t you? As mentioned in Part 1, you can use the same test in pregnancy and postpartum. However, from about the 18th week of your pregnancy the height of your uterus can affect the test and you may not feel comfortable lying on your back, even for a short while. Therefore I suggest that in addition to, or as an alternative to the test where you lay on your back (if you cannot do that comfortably and safely), you can also consider the following diastasis recti tests. 1. Belly Button Test: Take a look at what is happening to your belly button! Did you have an “inny” pre-pregnancy and now a very extended “outy”? If the belly button is bulging out that can be an indication of DR. Note – you can still have DR with an “inny”. 2. Bump Test: Look at your bump in good light in the mirror. Consider whether you can see a gap around the belly button and above and below it. Take a look both with and without clothes to see whether you can see anything different. 3. Feeling Test: Feel the area around your belly button while standing up. Do not apply too much pressure. Just gently feel over the belly and note whether you can feel any gaps. 1. Consider your posture: You should try to maintain a neutral spine at all times. Do not stand or walk with your belly pushed out. 2. Movement: Think about how you get up and down from the floor or a seated position. If getting out of bed or up from the floor, roll onto your side and then push up with your hands. Never use your abdominal muscles alone to get up, particularly from the latter stages of your second trimester. 3. Lift Carefully: Be careful how you carry or pick up a heavy object (such as your eldest child!). Bend down with your legs rather than bending your back and throwing forward your hips. Keep the object you are carrying as close to your body as possible and use two hands to carry the object. Exhale as you pick up the object, do not hold your breath. Where possible, get someone else (non-pregnant!) to move or pick up heavy items!!! 4. Do not strain: Pregnancy can have the wonderful side effect of causing incontinence…if you are suffering with this, do not strain and hold your breath! Straining can also occur when picking up an object or weight lifting, so watch your breathing! A big strain can also occur during the pushing phase of labour! I know that when you are pushing DR is the last thing on your mind (and all preparations can go out of the window! ), but practice the correct breathing techniques and how to relax your pelvic floor to at least give yourself a good chance of not overstraining as you push! -Push up – a modified push up may be ok if you had a strong core pre-pregnancy and are used to doing them. For a modification, you can do an incline push up from the start of your third trimester. 6. Lift Weights: If you lift weights during pregnancy (which I recommend as part of any fit pregnancy exercise regime) then make sure you concentrate on your breathing throughout. Exhale on exertion and do not at anytime hold your breath, which will increase internal abdominal pressure. Further, if you lifted pre-pregnancy I recommend you decrease the weight you lift as your pregnancy progresses. If you did not lift pre-pregnancy then keep your exercises to bodyweight exercises or only use very light weights. At all times listen to your body as to what is a sensible weight to use. 7. Avoid the Cone: Anything that causes your belly to “cone” should be avoided. Taking a look at your belly is a good way to monitor whether the abdominal pressure is too great. Should you wear a support band? Wearing a maternity support band or high support workout top or taping your belly during pregnancy may help DR not to get worse. They are especially helpful during workouts or long walks/periods of standing. Running or sprinting is the one time I tend to wear a supportive maternity workout top. However, in my view, any of these supports should not be overused by daily all day use. Where possible prior to your pregnancy, and during your pregnancy, you should instead work on strengthening and maintaining a strong core. You cannot wear a band or the tape all the time and so it is important to also develop your own strong core that can support your growing baby. Having a strong core will also greatly improve your post birth recovery! Ok, so you cannot do all of the exercises stated above and from the beginning of the second trimester you cannot lay on your back for extended periods of time – so what can you do to maintain a strong core without increasing your risk of DR or making it worse? First…you can think about activating your core when you do all of your exercises – a squat or a lunge can be a great core workout because you need to activate your core to balance. Another good tip is to do your arm workout balanced on one leg! Second…there are lots of exercises you can safely do during pregnancy to get and maintain a strong core so why do the ones that pose a risk?! Good core exercises are really another whole topic, and I am conscious this blog is already long, so here are my top 5 exercises. The above exercises are also demonstrated on my Instagram if you scroll through! My page also has some core workouts for during pregnancy and tips and hints on doing them and I have an online prenatal training plan that gives you two core workouts that are suitable (with the modifications given or discussed with me) for your entire pregnancy. If, like me, notwithstanding your best efforts, you do get DR then do not panic! It can be healed post birth and I will cover that in diastasis recti part 3…. coming soon! That’s right, if you’re a mom who’s ready to GET YOUR BODY BACK (no matter how old your baby is), you’re in the right place. Click HERE and I’ll reveal how busy moms like YOU can burn fat and get your body back – in less than 3 hours per week.